Hello Friends I hope everyone is aware about the SNC Event running at my space. It is an event that runs every month, where two teams challenge each other with their authentic recipes, and the opposite teams have to complete their challenge within a months time. One winning team will be decided and awarded the trophy each month. It was like yesterday when I announced the challenge, but the first month challenge has already been completed successfully. I really want to thank all of you who had been a great support for making this event a successful one. And here comes the round up for October. 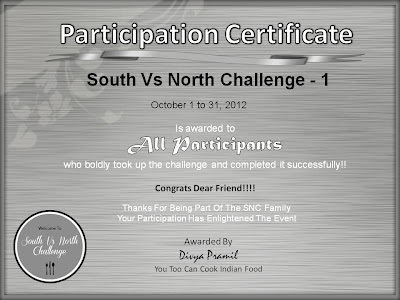 South Vs North Challenge is an event started by me a month ago. The basic concept of this challenge is to learn new regional recipes with the help of a an event that would be fun too. I segregated Indian bloggers into two teams depending on the region they belong to, The Northern Team and The Southern Team, for further details click here. Here one person from each team challenges the other team with their authentic recipes. And the teams are given a months time to complete the challenge. This challenge will be new every month and anyone willing can challenge. Finally score will be calculated based on certain criteria and the team with the maximum number of points wins. Some awards and badges are provided to best performers and also to the winning team. There are totally 40 members in our SNC family. 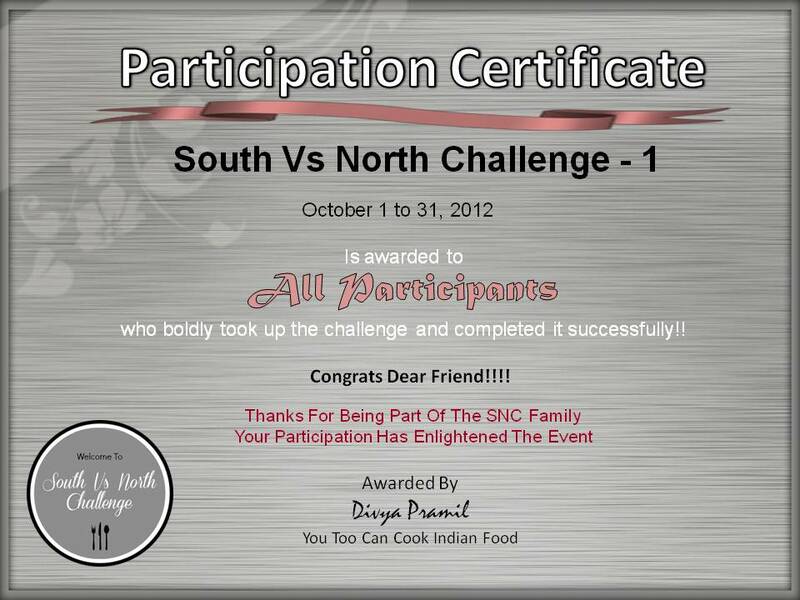 Among them 11 from the Southern team and 7 from the Northern team had completed the October month's challenge. Some were not able to participate due to ill health and other personal issues. But still all of them stayed together during the whole journey and helped each other. So now I know many of you would have scrolled down here to see who's the winning team but common check out what I have written above. So the winning team is!!!!!!!!!!!!!!!! they lead the Southern team with "25 points" Wow that was really a good score!! Northern team members grab the Above Trophy and Certificate and post about it on your space if you wish!!! Other Participants Grab Your Participation Certificate!! Choose the ones you like!! Please keep in mind that the point system here is only for encouraging and fun, it does not mean one team is superior or inferior ti the other!! Shruti and Divya Prakash helped me a lot in selecting the well presented, most commented and well explained categories. Thanks a lot friends. 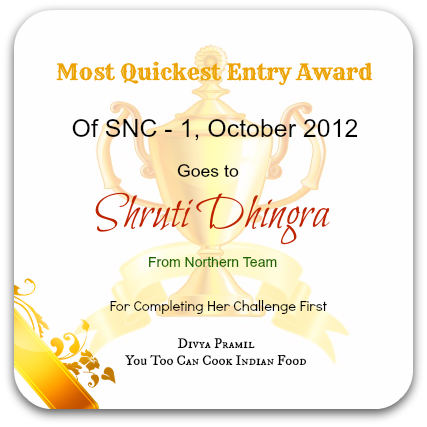 Most Quickest Entry - Goes to Shruti. The one who completes the challenge and links first among all the entries wins 25 points; Shruti completed her challenge first and also linked it first so she has won her team 25 points. Even if you have completed the challenge and have not linked it wont get the 25 points. Well Presented Recipe - Goes To Sireesha & Minnie Gupta. 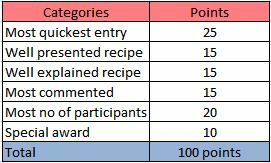 One well presented recipe from each team will be selected and awarded 15 points each. Preference will be given to the picture and presentation. This time Shruti had selected Sireesha from the Southern team and Divya Prakash selected Minnie from the Northern team for presenting the recipes well. So they are winning 15 points for the team they belong to. Well Explained - Goes To Viji. The team with the perfect explanation about SNC and the recipe will get the well explained post award. This time there was a competition among Viji, Meena, Priya Sateesh, Priya Suresh. All had explained the SNC well but Viji had out done it and also had posted the logo on her side bar. So Viji wins 15 points for her Southern team. Most Commented - Goes To Priya Suresh. The recipe with the most number of comments among all the entries (includes both south and north) will win 15 points for the team. This time Priya Suresh from the South team had 47 comments and so she wins 15 points for her team. Most Number Of Participants - Though there was an imbalance between the team I could make out that more than half of the northern team members had participated in the challenge. And when comparing the ratio with the Southern team Northern team had won this part. 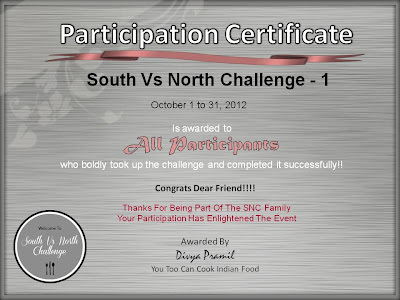 Out of 28 only 11 were able to complete the challenge but in the Northern team out of 12, 7 had completed the challenge. So clearly the Northern team has won the 20 points here. Special Award - Goes To Shruti. And coming to the special award the one who excels in the challenge by performing well in any way will be awarded a special award according to that the individual who earns this credit or badge will earn an extra 10 points for her team. 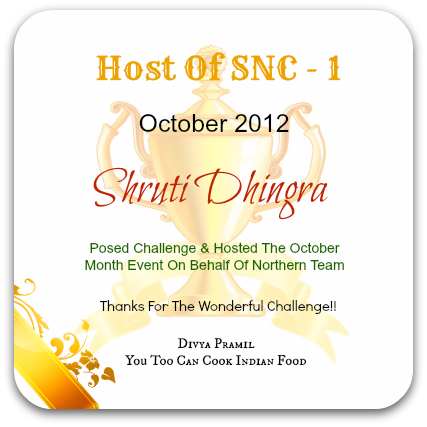 This time Shruti wins this special award and so she wins her team another 10 points. For the award she has won check at the bottom of the post. The total score of Northern team is 70 and that of Southern team is 45. Now Southern team members don't let your spirits down. I really want to appreciate the work of the Southern team members, Bhel puri may have sounded easy but only when you have all ingredients in hand it becomes an easy task. But still all who participated really did a wonderful job by preparing everything right from scratch. The task was bit difficult and I hope that is what a challenge means. Thanks for the wonderful challenge Shruti. And Mysore pak I must mention is not an easy to make recipe. Even the South Indians struggle to get the perfect consistency but still all the Northern members who had participated willingly took up the challenge and made it out well. 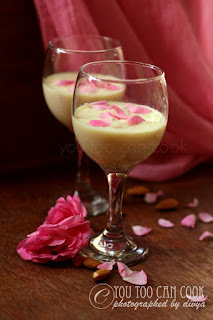 Thanks Divya Prakash for the sweet start. I appreciate the spirit of all the participants of October month. Its Time To Shower Awards!!! Both the challenges were really amazing and they hosted the challenges really well. 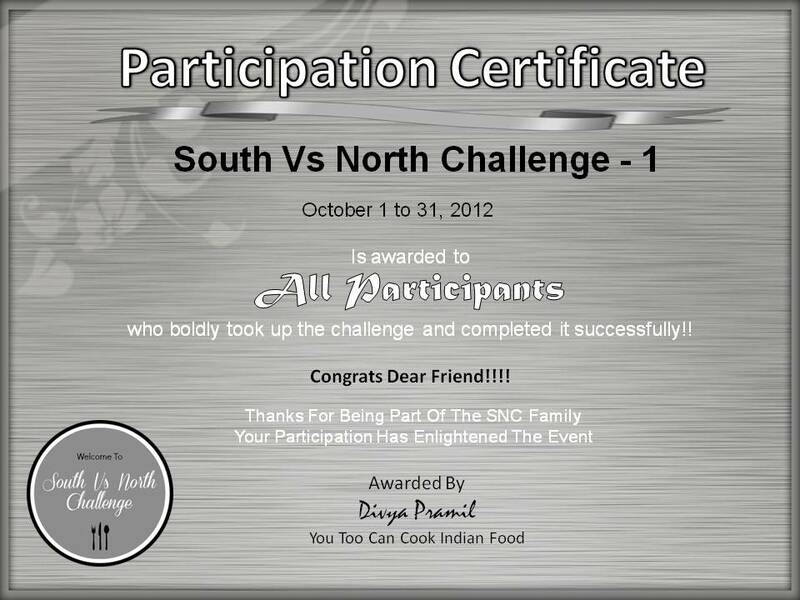 Thanks for the fabulous challenges Divya Prakash and Shruti. They really coordinated the team well and helped one another with the challenge. Divya Prakash & Shruti grab your badges!! This is awarded to the most quickest entry. Shruti had linked her entry first and is earning 25 points for her Northern team. Grab your badge Shruti. 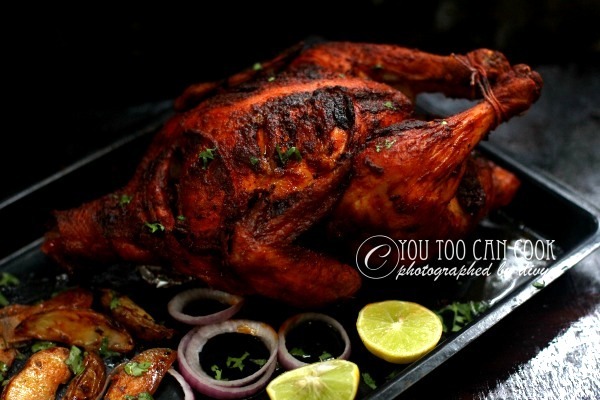 Shruti chose mine to be the well presented recipe. But I don't want to be a competitor I found this event and I don't want to grab all these certificates and badges for myself. So am passing this award to my team member Sirisha for her neat presentation. Grab your badge Sirisha. For Northern team goes to Minnie Gupta for her delectable presentation. Grab your badge and certificate Minnie. Goes to Vijayalaksmi from Southern team. Award goes to her for the following reasons. For her well explained posts specially about SNC. 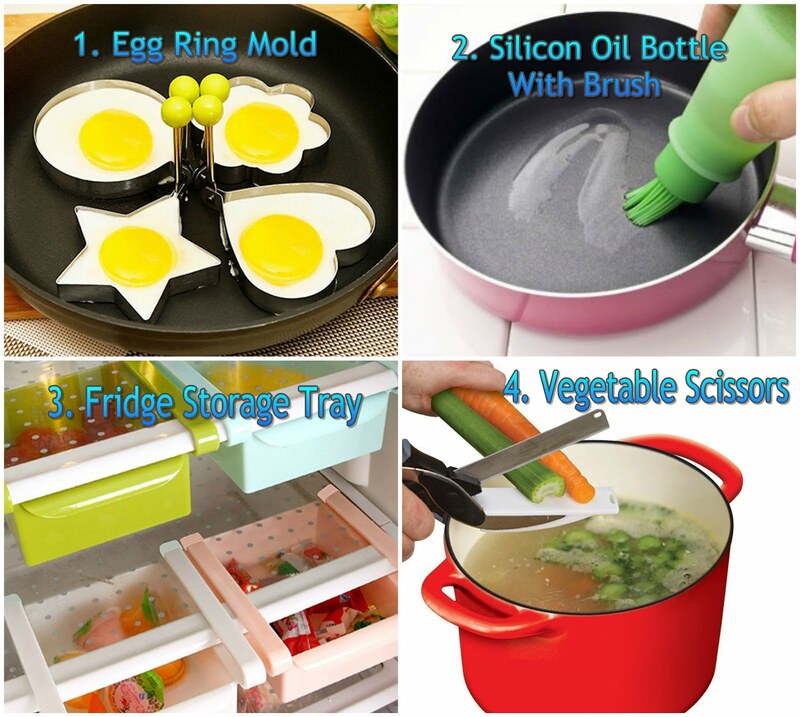 Well explained recipe with step-wise pictures. And she had also posted the logo on her side bar which I had mentioned about in my SNC post. I did not find the logo of SNC on the side walls of many participants. Also the Northern team completely failed to do this, so they are not getting any points for this. 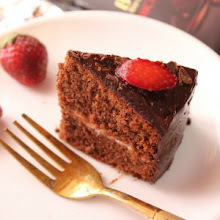 This award goes to the recipe with the most number of awards among all the entries. And it goes to Priya Suresh, her bhelpuri has got the highest number of comments (47 comments). Grab your badge Priya. Now to appreciate the best work and make winning more interesting I have created a special award. This will be given to the best performer each month and she will score some extra points for her team. Check out October month's SNC Queen!! Congrats Shruti you have earned totally 35 points for your team!!! Shruti has won this based on her outstanding performance as, host, participant and also achiever. 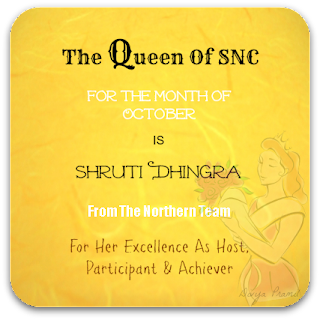 She posed the challenge on behalf of the Northern team, She completed the challenge first and also linked it first and earned her team extra points so she gets the Queen of SNC award for the month of October. This award will be given to the best performer every month and also the best thing is she will earn some points for her team too. This part of decision will be taken by me, while the rest scores will be decided by the hosts who will be posing the challenges of that particular month. So dear friend next month's Queen might be you...... Take part, perform well and win this badge and make your team the winner!!! There are some who should be really appreciated for their awesome work. One such person is Sowmya from Sowmya's Kitchen. She joined our SNC event almost near the end of October but she took up the challenge and completed it and linked it too. So special applauds to Sowmya. 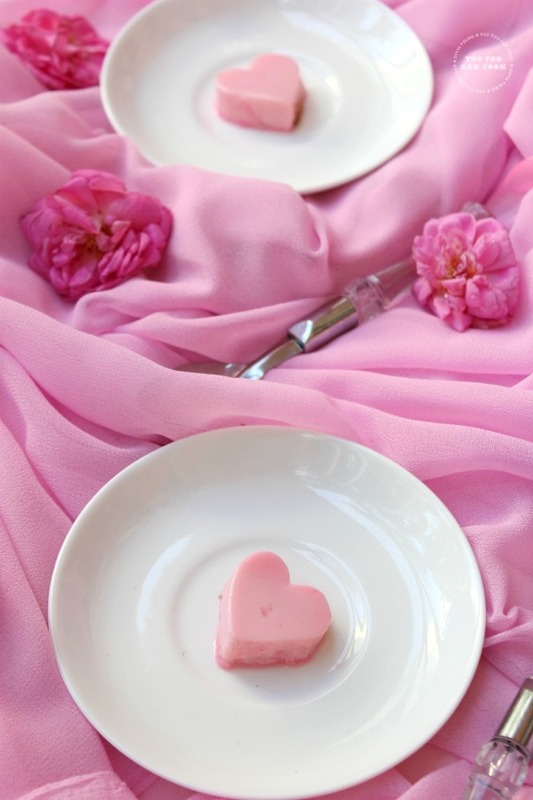 Do visit her site and encourage her she is new to blogging. Those who have joined SNC recently kindly check whether your name is in the list, if not please mail me I might have forgotten. Also I have created a Google group only through which I will contact you i.e. send mails and post updates reg SNC. If you are not in the Google group please send me a mail I will send you the invites. All the best to both the teams!! 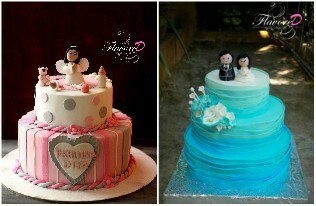 Divs u hav so much patience dear! Great work there! Divya, I totally, completely floored. This is a MONUMENTAL amount of work. Unbelievable.And the way you have set out the scoring inspite of the imbalance in the teams is brilliant. I can't believe the amount of work you have put in - you are an exceptionally talented and dedicated person. Thank you so much for this beautiful competition, and even more important, the opportunity to be a part of this exceptionally talented group. Looking forward to the coming months. Yippieeeee Northern team won !!!!!! Congrats Northern Team & QUEEN OF SNC. Special Wishes to the award winners -Shruti,Sireesha,Minnie,Viji, Priya Suresh,Sowmya and the members of SNC. Also congrats to my friends who getting special prices!!! Super darling.. I'm just stunned about your work!!! Love you dear!!! Brilliant work dear!!! Wow wat effort Divya, well explained and detailed roundup.. Congrats to the Northern team,they rock. Am very happy to get 15points to our team,congrats to everyone who the awards. Congrats friends of NORTHERN TEAM :) and friends lets keep this spirit going on..congrats to all of us for being part of this fantastic challenge..
would put up the badge soon and congrats north team and south team was not lagging behind they did exceptionally well. wow its incredible... Gr8 Gr8 job... HATS OFF TO U BOSS!!! 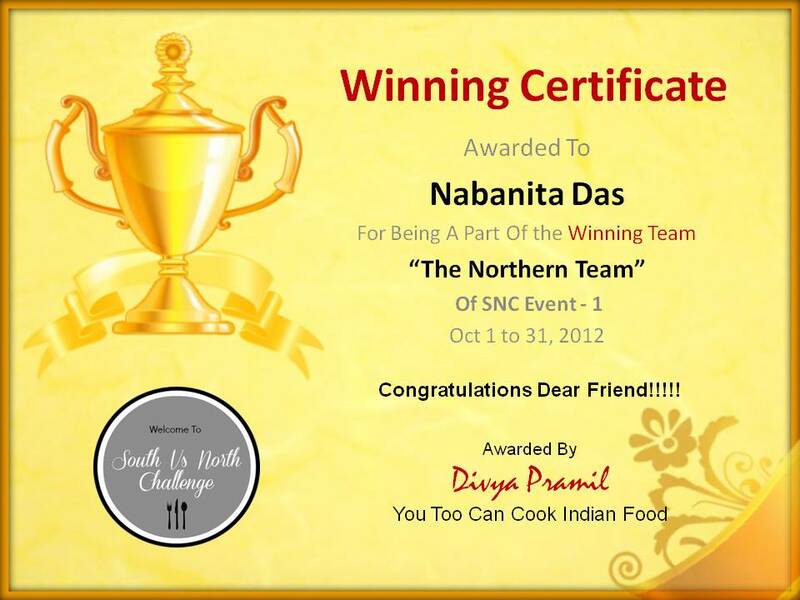 n Congrats North Team and All Award winners and all participants of OUR SNC... No word for your work!!! Wow congrats to all of u.
Congrats for all the award winners n divya u done a great job!!! kudos to u dear!!! Hats off to your effort Divya. Excellent round up. Thanks a lot dear. 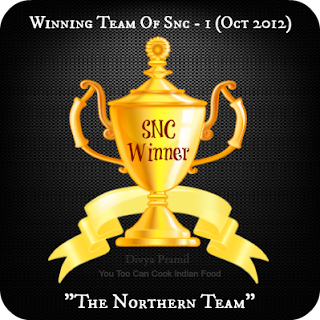 Feeling really proud to be in SNC family.